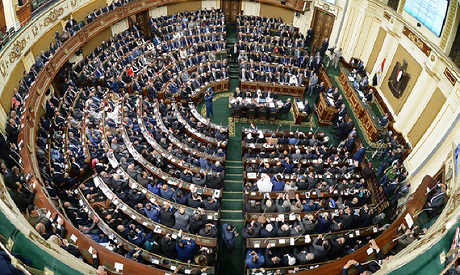 Many Egyptian MPs have issued statements in recent days asking that the country's 2014 constitution be amended. Some revealed on Saturday that they have signed a petition asking that some articles of the constitution be amended, and that they intend to submit it to speaker of parliament on Sunday. According to Article 226 of the constitution, the president, or a fifth of the total number of MPs (596) are authorised to ask for the amending of a article or several articles of the country's national charter. "The petition in this respect should show what kind of articles are wanted to be amended and why, and that in all circumstances parliament should discuss the petition within 30 days, and a two-third majority of MPs should vote on whether all or part of the petition should be accepted," Article 226 states. There are strong rumours in parliamentary circles that the petition will be submitted to speaker Ali Abdel-Aal on Sunday. Parliament held three days of plenary sessions last week. It was supposed that it would take a holiday this week as a routine measure. But speaker Abdel-Aal took reporters by surprise on Tuesday by announcing that new sessions will be held this Sunday. Abdel-Aal urged MPs to attend Sunday's session, stressing that "we are expected to discuss important things, and all should be keen to attend." Abdel-Aal's words created speculation that the long-rumoured constitutional amendments would be submitted on Sunday. Meanwhile, MPs were keen to issue statements on the constitution, arguing that it was drafted in a hurry and at a time Egypt was facing international pressure, particularly after the removal of the Muslim Brotherhood regime from office. MP Mahmoud Badr tweeted today that "I, with a group of my colleagues in parliament (representing a fifth of MPs) have just signed a petition, asking that some constitutional amendments be submitted to the parliament speaker tomorrow (Sunday) in order to prepare for the necessary measures in this respect." President El-Sisi was elected in March 2018 for a second term of four years. He was elected for the first time in May 2014. MP Rashad Shoukri, a member of the tourism committee, also told Ahram Online that "the constitution is not a Quran or a Bible and Egypt needs constitutional amendments to make the country more stable in the coming period." "The current constitution was drafted in very exceptional circumstances, and under tremendous pressure to serve an interim period, but it is now the right time that some of the articles of this constitution be reconsidered, and at the end it is up to the Egyptian people to vote in favour of these amendments or reject them," said Shoukry. MPs also ask that the amendments include a new article recreating the old Shura Council, which was dissolved in 2013. They say this council should be reinstated, and that its name be changed to "the Senate", and it should have both legislative and supervisory powers. MPs also said they want to change Article 147, which states that the president can dismiss the government or introduce a minor cabinet reshuffle only after getting the approval of the majority of MPs. They want the Article to be amended to give the president greater flexibility in making cabinet changes.